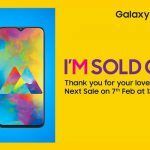 It is an open secret that Samsung is about to launch its new M series phones before the end of January 2019 in India. 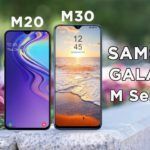 As of now, we know that the M series – at least for the time being – will consist of three devices, the Samsung Galaxy M10, the Galaxy M20, and the Galaxy M30. Samsung has so far been able to keep the spec-sheet and the design schematics of these devices under wraps. 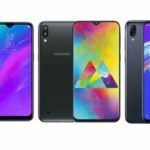 That was until January 17 when a couple of images showing the schematics of the Samsung Galaxy M10 were leaked online by folks from over at Pricekart. 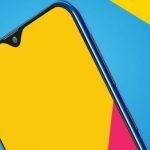 The Galaxy M10 features too leaked, which we are going to detail in this story below. The M10, in case you have not guessed already, is likely to be the most affordable of the three new phones. However, unlike older budget handsets from Samsung, this one seems to have been designed keeping in mind the budget segment competition in mind where brands like Xiaomi, Realme, ASUS, and Motorola are giving Samsung’s outdated, rehashed J-Series devices a run for their money. 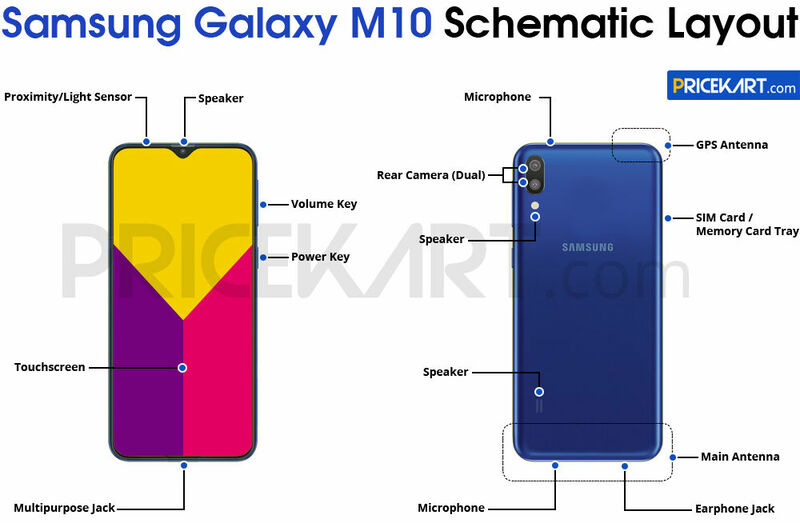 Anyway, because the title of this article was about the leaked schematics of the Galaxy M10, let’s take a look at them now. As seen from the images above, the Galaxy M10 seems to be a decent, premium looking handset. The phone features a large display at the front with very thin bezels. While we do not know the display size yet, considering this is an entry-level device, there is good chance that we might see Samsung use an IPS LCD panel on this device instead of an AMOLED panel. This is mere speculation at this time, though. Another thing you will notice from the image is that the handset features tiny waterdrop notch at the top. This notch will reportedly be called the ‘Infinity-V’ by Samsung and it is there to make space for the front facing single camera. 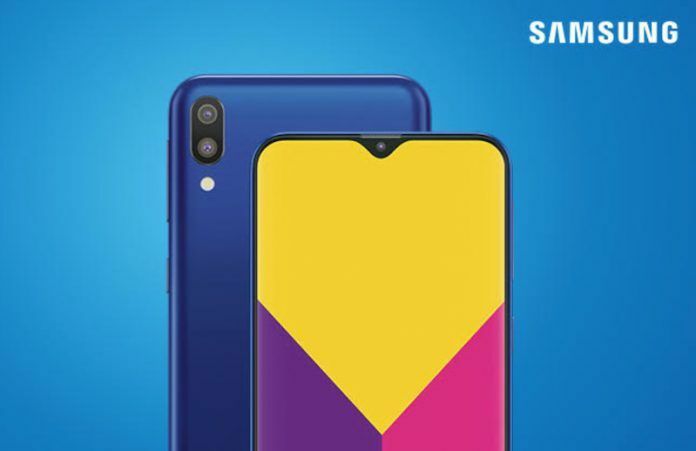 The rear panel of the Samsung Galaxy M10 is more interesting and features a dual camera setup flanked by an LED flash. Another interesting addition is the presence of a speaker grille on the rear panel. What you cannot see on the back panel, however, is the fingerprint scanner that is a common feature on even budget smartphones these days. While there is a slight possibility that the phone might feature an in-display fingerprint sensor, this is very unlikely to happen since the Galaxy M10 is an affordable, entry-level handset. You will also notice that the Galaxy M10 will come with a 3.5mm jack and microUSB port at the bottom. On the left side of the handset is where the SIM slot is. This slot will also accept microSD cards when needed. The power button and the volume rocker keys are located on the right. While not confirmed yet, current rumors point towards the possibility of the Galaxy M10 featuring a 6.2-inch IPS LCD panel with HD+ resolution. The phone is likely to use Samsung’s own budget chipset – the Exynos 7872 – that was announced last year but wasn’t used on any Samsung phone until the M10 came along. 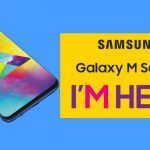 As of now, it is expected that the Galaxy M10 will come in two versions – a base 2GB RAM version and a pricier 3GB RAM variant. We still do not know how much internal storage these versions will get. The phone is also likely to get a 3,400 mAh battery and will run Android 8.1 Oreo at launch. The dual camera setup at the rear is likely to be a 13-megapixel + 5-megapixel combination. We still do not know anything about the front camera setup.